The High Court reduced by one year a jail term for Anat Kam, convicted of stealing and exposing IDF documents while she was a soldier. The High Court Monday morning reduced by one year a jail term for Anat Kam, convicted of stealing and exposing IDF documents while she was a soldier. 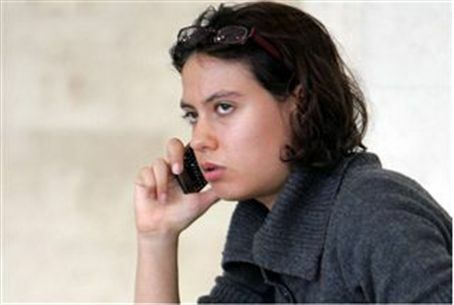 She turned over the material to Haaretz journalist Uri Blau, who was sentenced to four months of community service. Kam filed the appeal after Blau's relatively light sentence. Kam stole and passed on to Blau more than 2,000 classified documents while she served in the army. She was sentenced last year to four and a half years in jail, and the judges at the time said the stiff sentence was necessary to make it clear to everyone that her violations were totally unacceptable. The judges' majority opinion in the High Court on Monday explained that they agreed to take one year off the jail term because she was a first-offender and has cooperated with the authorities. Kam, 25 years old, now will be eligible for parole in 14 months. High Court president Noam Solberg dissented in the 2-1 decision. Knesset Members Aryeh Eldad and Michael Ben-Ari of the Otzma Leyisrael party criticized the court for reducing the sentence. They issued a statement which said, "After the Supreme Court allowed terrorist Hanin Zoabi to be a Knesset member, yesterday, it's impossible to be surprised that today it eased the punishment for Anat Kam the spy. It appears that spying and terror are preferred professions in the halls of the court, as long as it's for the good of the Arabs." Member of Knesset Otniel Schneller (Kadima) said that if the Knesset had approved the second and third readings of his bill to increase the sentence for similar violations to 10 years, the court would have followed suit. The former head of the Yesha Council of Jewish communities in Judea and Samaria (Shomron) added, "The duty of any democratic state to protect the security and safety of its citizens - is bigger than the freedom of information and its use. Subversion against the state based on ideology is the nearest crime to espionage."